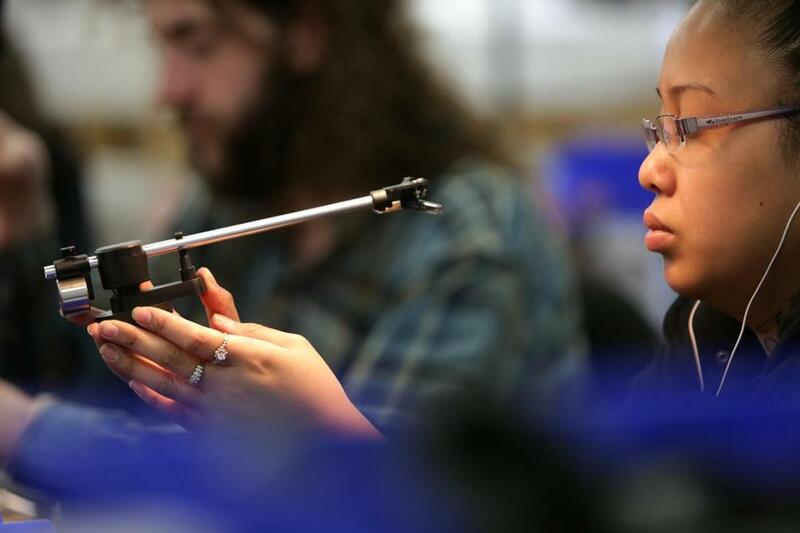 At U-Turn Audio in Woburn, Mani Xayavong inspected a tone arm. When Ben Carter, Bob Hertig, and Peter Maltzan were born in 1988, vinyl phonograph records were headed the way of black-and-white TV and eight-track tapes. Yet the three high-school buddies became avid vinyl buffs. They were ahead of the curve. Today, Americans are once again buying vinyl records by the millions, believing they sound better than digital downloads or Internet audio streams. But good records need good turntables, or they’ll sound lousy. Carter, Hertig, and Maltzan say they’ve figured out a way to build good ones at modest prices. Now they’re cranking out up to 100 of them per day at their Woburn company, U-Turn Audio Inc.
U-Turn is aiming to tap an unexpectedly lucrative market for a technology that once seemed extinct. Ten years ago, Americans bought fewer than a million vinyl records, according to Nielsen Co. Last year, we purchased 12 million. That’s $416 million worth, according to the Recording Industry Association of America, or 32 percent more in revenue than the year before. U-Turn’s tables are priced from $179 to $399. While they can’t compete against state-of-the-art machines costing thousands, they’re better engineered than other low-cost brands, U-Turn’s founders say, largely thanks to Hertig, a mechanical engineer who’s designed many critical components, like the tone arm that touches the vinyl record. Top-quality tables use jewels in their tone arm bearings; Hertig designed a cheaper version that uses high-grade aluminum. These days, most inexpensive consumer electronics gear is imported from China. But while some U-Turn components, like electric motors, are Chinese imports, the company estimates that at least 80 percent of its parts are American-made. 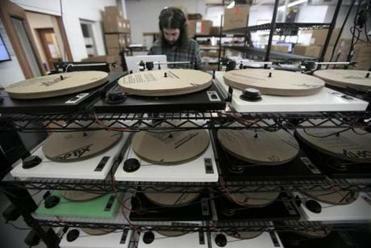 All of their turntables are assembled in their Woburn facility. Outhai Khampannha tested a record on a newly assembled turntable. Carter, Hertig, and Maltzan have hung out since their teen years; all three graduated from Lexington High School in 2007. Hertig, who grew up listening to his parents’ record collection on a Fisher-Price children’s phonograph, was already in love with the sound of vinyl. He began a used-record business in high school, and introduced Carter and Maltzan to the audio format. “We’re all listening to vinyl by the time we got to college, which at the time was not that popular,” Carter said. But they carried their love of old-school recording to three different schools. Carter graduated from Cornell University in philosophy, Maltzan got a degree from Berklee College of Music, and Hertig studied mechanical engineering at Northeastern University. By the fall of 2011, they were all living within a block of one another in Allston, and contemplating their future careers. “Pete and I are having a few beers on the porch, listening to a really bad record player,” said Hertig. Both men were sure they could do better. Turntables are tested by running them for a while to check the motors. Carter, who hated his job at a health care consultancy, eagerly signed on, and U-Turn was incorporated in 2012. 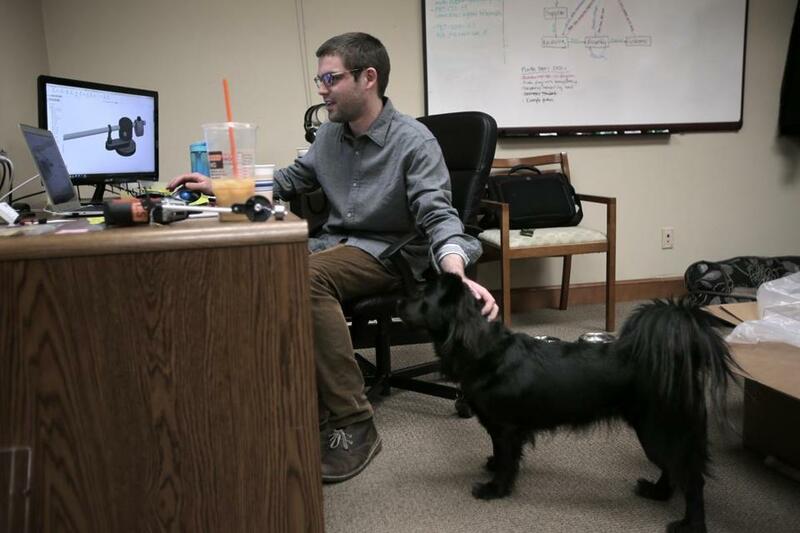 A business incubator program at Northeastern gave them $2,500 in seed money, enough to build their first prototype. This earned them the chance to seek investors at the crowdfunding website Kickstarter. The three entrepreneurs set a goal of $60,000, but $234,000 rolled in. “That’s when we knew it was an idea that had legs,” Hertig said. The base and rotating platter of the standard U-Turn table, the Orbit, is constructed of plastic-sheathed fiberboard. For $90 more, customers can choose a platter made of clear acrylic plastic. They can also select more costly cartridges — the element that holds the needle to the vinyl and reproduces the recorded sound. Bob Lefsetz, music business analyst and publisher of the Lefsetz Letter, loves listening to phonograph records. But he suspects the current revival is a fad. “The reason vinyl died originally was that it was inconvenient,” Lefsetz said. “To put on a record is a big hassle.” Once the novelty wears off, he said, music lovers will revert to simpler digital options, like Apple Inc.’s iTunes, Pandora, or Spotify. The U-Turn team is more optimistic. They’re making and selling up to 100 turntables a day. The bookstore chain Barnes & Noble, which has found success in selling vinyl records, now sells U-Turn tables in about 20 stores. The company also has a deal with Third Man Records, a Detroit label owned by Jack White, lead singer of The White Stripes, to produce a line of customized turntables. And U-Turn plans to design higher-end tables for audiophiles and to start selling its products overseas. Bob Hertig, designer, president, and cofounder of the company, worked on a new design for a tone arm. Hiawatha Bray can be reached athiawatha.bray@globe.com. Follow him on Twitter @GlobeTechLab.